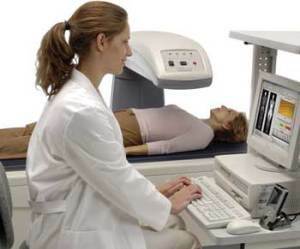 DEXA SCAN, or Dual Energy X-ray Absorptiometry scan, is a test that is noninvasive that uses quantified radiation to measure bone density, commonly in the lower spine or hip. A radiation detector is placed behind the patient and measures the amount of radiation that penetrates through the patient’s bone. The weaker the bone, the more energy that is transmitted to the patient and onto the detector. This test is commonly used to assess and evaluate patients for the treatment of osteopenia and osteoporosis.